This week's featured teacher is Wendy of 1st Grade Fireworks. What is your favourite part about teaching? I love when kids tell me the best part of their life is coming to school! If I can get them to WANT to be here, they can learn! The "lightbulb" moment is SO AMAZING! 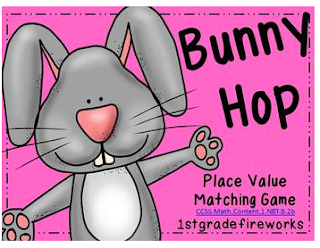 Wendy would like to share her Bunny Hop Place Value Matching Game from her TpT Store. You can download the file by clicking on the picture below. If you download this freebie, don't forget to leave Wendy some feedback for her generosity. You can do this by clicking on "My Purchases" and finding the download in your "Free Downloads" tab. Don't forget to check out Wendy's blog for some early primary inspiration! Thanks, Wendy, for participating in this week's Feature Teacher! I'm so jealous that you're out for the summer already! I still have 26 days left, but who's counting? !